The programs developed under MOST (Mobilization, Optimization, Stabilization and Training) elevate the performance of Boilermaker craftsmen and generate millions of dollars annually in cost savings for Owner and Contractor communities. Unsafe working conditions are a major expense for any project. While union-trained craftsmen command higher compensation than non-union workers, they consistently provide greater value to a project because their training helps employers avoid costly accidents and injuries. Through MOST safety programs, union Boilermakers have reduced lost-time injury rates by 90 percent. MOST programs solve safety and other industry issues by providing Contractors and Owners a competitive edge known as The Boilermaker Advantage, a performance standard that can be readily measured. For example, welding certification costs have dropped by 95 percent since implementing the MOST Common Arc Program, and 98 percent of drug-screening tests conducted by the MOST Substance Abuse Program come back clean. 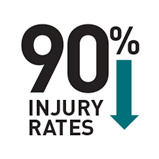 Union Boilermakers have reduced lost-time injury rates by 90%. Just as safety is recognized as critical to all involved and MOST programs provide a safer, more skilled craftsman, this same commitment now extends to behavior and culture with The Boilermaker Code. The Boilermaker Code affirms accountability for actions and is committed to eliminating negative behavior on work sites. The latest program to be added under the training area of MOST, The Boilermaker Code sets clear direction on job site conduct, reinforces value to partners and declares the expectation for excellence. The Boilermaker Code is not just words, it’s how we live. A total of 17 distinct programs contribute to The Boilermaker Advantage. These programs promote safe work practices; build proficiency in rigging, steel erection, and scaffolding; ensure member skills are at the highest level; create highly qualified field leaders; and promote the readiness, availability and expectation for excellence of the Boilermaker work force.